After all of the holiday feasting, I suppose I should jump on the light and healthy bandwagon. I prefer to eat in moderation, so I don't have to alter my eating habits, but I do have a few recipes that are light in calories and low in fat. This vinaigrette has only 4 teaspoons of olive oil, but it is packed with flavor. Half of the recipe comes from the balsamic vinegar, so please use the best vinegar you can find. If I am going to use all of the vinaigrette right away, I like to grate the garlic on my microplane. If I am going to use only a portion of it and store it in the refrigerator, then I just crush the garlic and leave it whole to infuse the vinaigrette with garlic flavor. That way the garlic doesn't overpower the vinaigrette as it sets up in the refrigerator. Toss it with a mix of baby mesclun greens, sliced red bell pepper, sliced english cucumber, or any veggies of your choice. Then season with kosher salt and freshly ground black pepper. You would never know that it was light in calories and low in fat. In a small bowl, whisk all of the ingredients until combined. Toss with your favorite greens and season with salt and pepper. Leftovers can be stored in an air tight container in the refrigerator for up to 1 week. Enjoy! I'm always looking for a good balsamic vinaigrette to make. I like the idea of using the grainy mustard in this one. 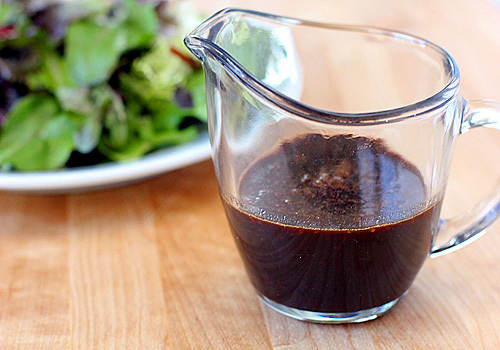 This recipe looks delicious, as I love to make my own balsamic dressing. Question: does this particular recipe have a strong mustard taste? I am not a mustard fan at all, but I'm thinking the balsamic will mask the mustard. Thank you. No, there is not a strong mustard taste. It is all about the balsamic flavor with just a hint of honey mustard. And the garlic keeps the vinaigrette from being overly sweet. Perfect balance of flavors. This vinaigrette sounds delicious! I love balsamic vinegar, and always use more of it than olive oil in my salad dressings. The touch of mustard, honey, and garlic sound like the perfect flavor accompaniments! Man this balsamic vinaigrette combined with the bottle of olive oil that my son just brought me back from spain--made from the first pressing of gourmet olives from Southern Spain-- is going to make the greatest salad dressing of all time. Just made this tonight with some gorgonzola and walnuts on some red leaf greens. Sooooo good and I LOVE that it's more vinegar than olive oil. Went so well with the crab cakes we had too! I made this for a salad of mixed greens, beets, roasted corn, a bit of blue cheese and some toasted walnuts. The dressing is REALLY delicious. It is so easy too. I know it is going to become our new go to vinaigrette. Thanks so much. I am so pleased you enjoyed the vinaigrette. Your salad combo sounds delightful! Thank you for letting me know.